The J/80 is the fastest growing one design sport boat fleet on Lake Ontario with 24 members. In 2017-18, 6 boats joined the fleet. 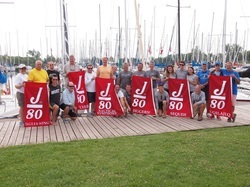 Hosting of the 2016 J/80 North American Championship at National Yacht Club in Toronto brought a bigger burst of J/80s on our lake than ever before. Fleet 20 has a strong core at the National YC in Toronto, with growth across the GTA yacht clubs. Our busy regatta calendar attracts J/80s from around Lake Ontario, including Royal Canadian YC, Niagara-On-The-Lake YC, Cathedral Bluffs YC, Nepean Sailing Club, Kingston YC and Genesee YC and also welcome boats from growing fleets in Ottawa and the Canadian Erie shore. ** Denotes races NOT included in the J/80 Fleet20 Series Championship Trophy. ** Denotes races included in the J/80 Fleet20 Series Championship Trophy. If a regatta above is missed in order to compete in the Nepean One Design or the J/80 North Americans, that boat shall receive the average points of its total series championship results. I have many updates for you as we put winter behind us and look to a new season. You have seen some on our FaceBook page. Of course, FB is not for everyone, and content tends to get buried there over time, so this email is packed with sailing calories that we hope will help your planning. If you follow our FaceBook page ( https://www.facebook.com/groups/J80.LakeOntario.Fleet20/ ) you will have noticed our recent growth. Please offer a warm welcome if you get the chance, to Ed Berkhout (former J/105 owner) in Niagara-On-The-Lake, and to Richard Bruneau (former Martin 242 owner) at National YC. With other new faces earlier in 2017, we now have 11 active boats in the GTA. 2017 also saw the Ottawa fleet grow (5, + Hugh in Kingston, who has been known to ‘drop in’). See the attached updated list for other recent updates in your J/80 community. We know of interested parties and fence-sitters who like the growth they see in our fleet and the fun we have with our boats. That is why you see occasional postings about used boats for sale in our Facebook page. J/80s are much loved by their owners (we know why) so when they do appear for sale they sell quickly. We have the resources to help transport a boat to our fleet, whether it has a trailer or not. If you know of someone who is interested just ask them to get in touch with any of us and we can help get a boat moved. Please renew your class membership. Now’s the time. It is easy – one and done right here. https://www.j80na.com/membership.html Your class sticker will swiftly follow, to be displayed proudly on your transom while racing level as a class. The page outlines the value and support on offer to you as a class member. Modest as it is, the funds created are your class’ primary revenue source. Your class is a low-budget operation (just ask Ramzi Bannura!) that gets a lot done with the resources and with the yeoman volunteer efforts of a hard-working few. Right now, our fleet has an important and ingenious fund-raising initiative. A raffle for new Quantum sails! The raffle is also open to J/70 sailors, but cleverly all the funds raised go to the J/80 Class. We obviously want the winner to be a J/80 sailor, so buy your ticket to ensure you have a shot. Some tickets remain and the draw will be held at the Annapolis NOOD Regatta on May 4/5. https://www.j80na.com/store/p12/J%2F80_or_J%2F70_Sails_-_Raffle_Ticket_%24100.html – easy PayPal or credit card process. Toronto area fleet, note that the ABYC regatta is included in the calendar. While not one that counts for the series (if that’s your focus), this is a perennial favourite for the One Design fleets in the GTA, and a great opportunity for our fleet to show off in front of the others. It’s also a great rust-remover and a chance for the crew and boat to get tuned in. We expect another strong J/80 showing! Toronto’s first J/Fest was a great success, both as an event and especially for our fleet. The event is back for 2018, hosted by the National YC. http://www.thenyc.com/racing/regattas/2018-jfest/ Trudy Murphy’s hard work in the 2016 J/80 North Americans at National YC has not gone unpunished, and she is leading National YC’s work in hosting J/Fest. So we can be sure the J/80 fleet will be well treated at this terrific event. J/Fest will also be our Hans Fogh Memorial J/80 LO Championship. 2017 flooding hit the East end, south shore of the lake particularly hard, flooding out the yacht clubs and forcing the cancellation of LYRA. However LYRA is back, hosted by these two great clubs. You can be sure of great breeze and a warm welcome, and our local J/80s are excited to once again host their fellow J/80 sailors. Many thanks to Owen Schneider in his work with PHRF-LO Central for helping tidy up the inconsistencies in the ratings for various J/80s in the area. We now have a uniform One Design rating. This means that a J/80 compliant with class rules will be assigned a 126 second/mile handicap for PHRF Racing. There will be no need for sail measurements, etc. If an owner wishes to sail with a genoa configuration (as a few do) or for any other reason prefers to have their sails measured they can opt to do so and have whatever that rating produces as any other boat in PHRF. Our FB page in particular generates much profile for our fleet. We can see that it is being watched by many non-J/80 sailors who are interested in our growth and momentum. Please jion in the conversation, post a picture of your boat launch, a weeknight sail, or comment on the content. You are all great ambassadors for our fleet, thank you. Keep spreading the word, invite people to sail with you, or pass them along to Trudy, Lawrence, Will or anyone in the fleet and we will be sure to take them out for a sail. The J/80 Toronto Area Series Championship was introduced in 2017 and comprised of 5 regattas: RCYC, J/Fest, NYC, Argosy & QCYC. 2017 has been a real challenge so far in dealing with record flooding on Lake Ontario and beyond. Our home clubs have struggled mightily to get the sailing season off to a good start. Our friends in the eastern end of Lake Ontario have been especially hard hit, with many docks still underwater and their home clubs still nowhere near operating normally. LYRA 2017 is scheduled for Aug 4-6 in Rochester, hosted by Rochester YC and Genesee YC. At this time, understandably, the host clubs are unable to commit to running the regatta, and will not be able to make that decision until July 1st or later. As in the past, we selected the LYRA Regatta to be the J/80 Lake Ontario Championships, assuring us of a great, well-run event for our growing fleet. However, given the above uncertainty, your fleet Exec feels it is prudent to instead make the 2017 J/Fest Regatta our Lake Ontario Championship event. In making this decision now, we hope our more distant fleet members have enough time to plan a trip to Toronto for July 22-23. LYRA will remain a 2017 fixture on our calendar and for the future, and if LYRA does proceed, we strongly encourage all to make the trip to Rochester for what is sure to be another great sailing event, hosted by a great sailing community. In spite of the challenges in getting the season started, the Toronto area fleet has managed to run two incredibly competitive regattas in superb sailing conditions. In addition, last weekend saw a second J/80 fleet compete in the Nepean One Design Regatta, with Hugh McGugan bringing Breakaway J to Ottawa, ensuring the local J/80s get a start in an exciting weekend of close racing. Nine boats racing in one weekend, with several others not able to make it to the start line but keen for our next regatta. We have new J/80s in Toronto, Ottawa and on Lake Erie. Our fleet is growing, has unbelievable racing and is being noticed by other fleets. 2017 is off to a great start, thank you for your commitment to the fleet, and see you on the water. What a crazy weekend at the ABYC J-Fest for the annual J80 Lake Ontario Hans Fogh Memorial Championship! Seven J-80s registered for the event with the fleet officially welcoming new skipper Owen Schneider and crew on Enigma from CBYC. Saturday saw the fleet bobbing about for hours when the RC were finally able to get 2 races going after 3pm. The course was filled with holes and personal wind lines that frustrated some and paid for others. Hugh McGugan on Breakaway J left the fleet in their wake throughout the regatta finishing first in ever race except the final one Sunday. A huge thank you to Hugh and his crew for trailering Breakaway J from Kingston to join us. Congratulations for taking home the championship trophy! Trudy Murphy and team on Feisty moved from second last position on Saturday to finish second overall. Gary Stephenson and crew on Flyer achieved solid results throughout the weekend to finish third overall. Click on the file below to view or download a copy of the minutes. Want more information about J/80’s on Lake Ontario or to arrange a demo? Click here to contact the Fleet Captain - David Doyle. Trudy Murphy's J/80 CAN78 Feisty wins 2016 LYRA OD Boat of the Year. J/80 fleet recognized as largest One Design Fleet at LYRA in 2015.